; $read = 1 means to read the stream, 0 means to write. ; $file = Which file to write the stream to. ; $streamname = What to call the stream? ; $write_msg = What to write. ; $encrypted = 1 means to encrypt/decrypt the message, 0 means not to. ; $epassword = The encryption password. ; $encrypted_level = 1-10 crypt strength. 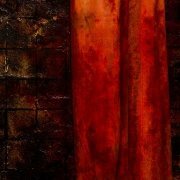 MsgBox(0, "", _ADS(0, "C:\.test", "test", "test! ")); Writing "test!" to ADS. There you go. The function and an example. ok i understand but is there any way to manipulate these streams, by copying them in autoit? 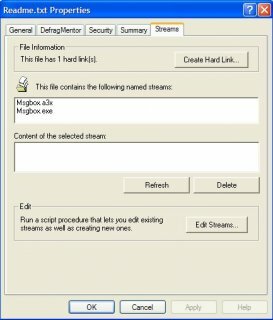 i know they cant be copied via windows, but can you actualy copy a stream with autoit . could yuo send it over a network in the alternative stream? 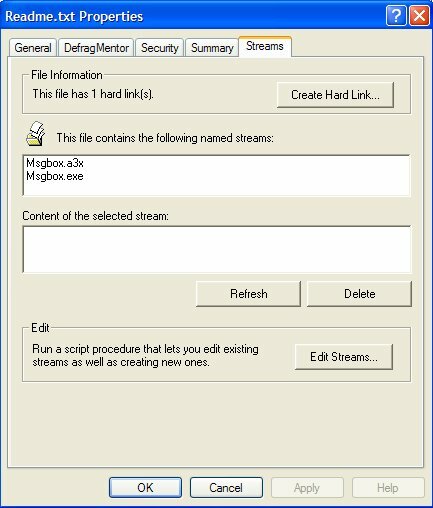 liek alternative stream packs that coudl avoid a packet logger? Not possible, and probably for a good reason too! it is possible and i;ve done it. EXE's can be run from an ADS. What if I told you that ADS can also be used with executable files? Thats right, ADS files that are executable can be attached to any file just like you attached .txt files, and just like the text files, would be hidden from most software. You have now created an ADS file called hidden.exe and attached it to the text file ads.txt. Once again, if you Dir the directory you will just see ads.txt, and not hidden.exe. Run LADS, and you will see the ADS. There is a caveat to launching executable files that are ADS files. You must always use the START command to launch the ADS executable and you must always use the full path of the file. Here are some examples of working commands and non-working commands. As you can see, you must use the full path of the ADS executable file. It works for me. I'm making a nice GUI for this too. i;ve made an application that converst files binary into hex, then you run another executable and it reads settings from a .ini. there is our donation to your project. Example on how to run A3x files in ADS. More easy: .ini in the ADS. I like how easy it is to utilize ADS, just what kills it pretty bad, is that you can't remove streams. Yeah, but that deletes all the streams...not a single one. Why make life so difficult. Just add the MS explorer tools to you file explorer. And you have all you need !! Link for that shell extension? That's the only way I know of removing streams, unless moved to non NTFS of course. Do you know of an alternate method? I guess you can use FileClose(FileOpen($file&":"&$streamname,2)) to Erase the data associated with a stream name, but it cannot delete the fork name. Maybe this can get you going. I think the general procedure for deleting a single stream (as archaic as it sounds) is to enumerate and read all the streams, delete all the streams, then write back the ones you want to keep.